Shimano's Talica II Two-Speed Lever Drag Saltwater Reel is about using heavy braid and live bait to catch the meanest fish that swim. To win, you need a compact, high-tech reel with an incredibly steep drag curve, for the power and control you demand. High Efficiency Gearing (HEG) with plenty of speed on the top end. Great castability, with super-hard, greaseless spool bearings. A compact, cold-forged machined-aluminum frame, sideplate, and spool with advanced Electrical Impregnation surface treatment and S A-RB ball bearings. 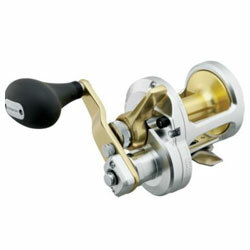 "I use this reel for grouper/snapper/tuna fishing in the Gulf of Mexico. This is a great all around reel. I used it to bottom fish for snapper, and cranked the drag up and put it in low gear to go for big grouper"
""I will be using this reel on a 17 day- long range tuna trip. On these trips the tuna run between 100 and 300 lbs.,with a lot of fish over 200 lbs. This reel has proven itself with 200 plus pound fish. " "Compact design and Strong drag, it works! worth every penny."